A little more than a generation ago, around one in three adults in the UK did not have any of their natural teeth left. By the time older people visited a dentist, it would be for the provision of denture care and replacement dentures, which were relatively easy to organise. Thankfully, a lot has changed in the intervening years and everyone now expects to keep most, if not all, of their own teeth throughout their life. However, this poses serious problems for older people who, through illness or frailty, may not be able to carry out routine hygiene procedures necessary to maintain their oral health. Consideration of an oral care regimen should be an essential part of any care plan. It can be extremely distressing for older people to no longer be able to care for their teeth as they always have done. First-hand accounts from older people also show how barriers stop them getting even basic oral healthcare. These barriers include anxiety from previous, outdated experiences; issues relating to poor general health which have a knock-on effect on oral health; side effects of medication; the cost of treatment; and being unable to travel to a dentist from a care home or acute hospital. There are also age-related issues such as forgetfulness and physical limitations, which mean even the most fundamental of oral health behaviours, such as twice-daily brushing, become more complicated. Poor oral health has well-established links to systemic diseases such as heart disease, diabetes, pneumonia and even dementia. Oral healthcare must be managed closely and carefully, as without effective intervention the outcome could be potentially deadly in older people, with bacteria from a poorly-cleaned mouth leading to aspiration pneumonia. The medications that older people take should be monitored for any oral health side effects. Dry mouth, for example, is a common side effect of some drugs. It may sound innocuous, but it can lead to accelerated gum disease and tooth decay, which are linked to severe systemic diseases. Sadly, there is not nearly enough provision afforded to health authorities to offer in-house oral health services for everyone, so it’s a case of managing older people’s care effectively to prevent any potential problems. As always, prevention is better than cure. Many nurses and carers express embarrassment at carrying out oral hygiene procedures, feeling that it is more intimate than many other roles, but they need to understand the importance of maintaining good oral health. 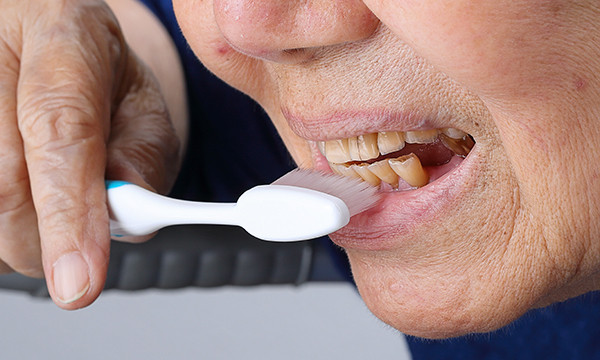 Implementing twice-daily brushing with a fluoride toothpaste, alongside the provision of a healthy diet, can be hugely effective and provide a great service for older people, helping them to retain their dignity by feeling they have a clean mouth. Build a relationship with local dental practices to arrange care home visits and educational materials. Pick the right brush. Using an electric toothbrush can help people with mobility problems to reach all areas of their teeth. Carers can help guide older people when brushing. If the older person you are caring for is in a wheelchair, you may find it easier to stand behind them when assisting with brushing.